POW meals ~ The Reluctant P.O.W. The following are comments from actual prisoners of war regarding the meals they ate. They are from different Japanese encampments but all have a similar diet. I have compared these and they reflect a good cross-section view of their meals. Summary at the end of this post. "Monday, Wednesday and Friday they got two meals a day of rice and daikon soup (Daikon is a large white radish). On Tuesday it was rice and daikon soup in the morning and rice and soya-beans in the afternoon with two small buns of bread. On Saturday rice and soya-beans again in the afternoon but no bread. On Thursday and Sunday the meal was rice and pork soup in the morning and pork stew and bread in the afternoon." "The basic ration per prisoner per day was 300 grams of a mixture of rice, kafir corn and rolled barley, 100 grams of greens and 10 grams of fish, all boiled. In American measurement of this ration, the equivalent is approximately 3/4 of a canteen cup of steamed rice and 1/2 of a canteen cup of soup. One small bun was added occasionally." "Our rations here were a teacupful of sloppy rice or barley in the morning and midday was a ball of rice, about the size of a tennis ball and at night it was a little rice or barley and a little fish soup, bones and everything. Fourteen to a bucket." "A cup of corn meal mush in the morning and twice a day a bowl of soy bean soup." 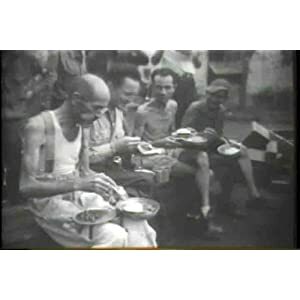 "Our food consisted of three meals a day of rice and barley mixed, with an occasional small fish and infrequent watery soup for breakfast." "Our food rations added up to a caloric in-take of barely enough to sustain life. Breakfast was called Lugao. Lugao is rice cooked in water to a constancy of oatmeal. Mid-day and evening meals were steamed rice and watery soup. One bucket of water and one Dikon - a Japanese radish seemed the recipe for POW soup." I'll check out preparation ideas, nutritional requirements and health problems associated with the meals/ingredients and work on the diet plan. I will try to use commercially prepared foods to avoid cooking surplus and for speed and convenience. I think this will help in keeping a tighter leash on surplus foods around me. Exercise instead of work should be incorporated, we will see.